Click HERE to check out the fares and deals on Emirates! 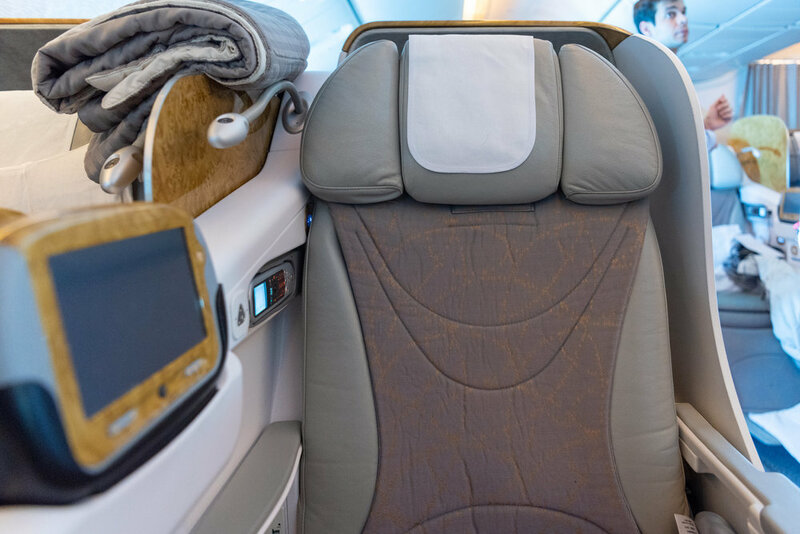 I slept for most parts on the flight from New York to Dubai and I arrived refreshed with less than 90 minutes to connect in the Emirates Lounge. Fortunately, all Business Class and First Class passengers were given an express pass to clear immigration quicker so they can get to the lounge faster - I made a beeline for the lounge to shower before grabbing a quick meal for supper. Much like my flight from Singapore to Dubai, flight EK352 from Dubai back to Singapore was operated by a 777-300ER aircraft which featured the less-impressive Business Class product. I was seated in Seat 9J which is an aisle seat and it is worth noting that the seat configuration on this flight is 2-3-2 which is ridiculous for Business Class (especially since Singapore Airlines operate a 1-2-1 cabin layout in Business Class for regional flights). I had my own noise-cancelling headphones on me but if you do not travel with your own headphones (you should! ), they are provided on the plane as well. A bottled water was also found in the seat pocket in front of me - a nice touch! 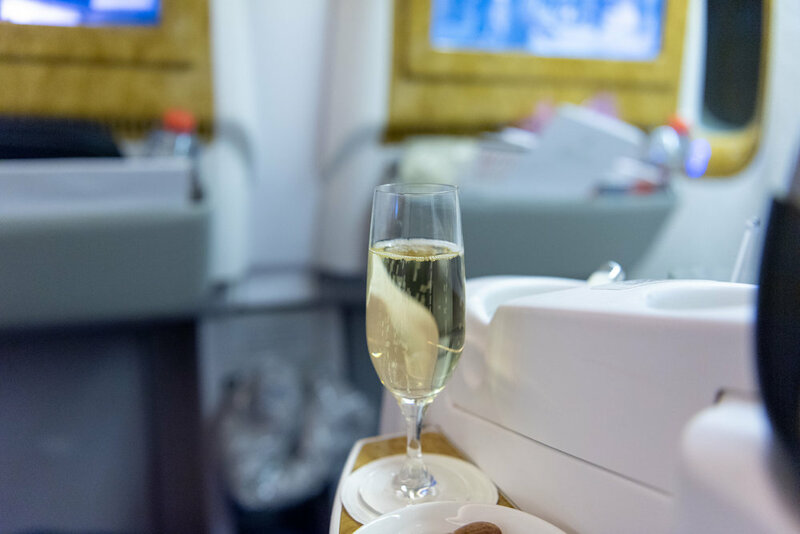 Welcome drinks (including Champagne) was served on the ground and all glassware were removed by the cabin crew prior to takeoff. The actual cabin product on this flight is comparatively older than the one I experienced on my flight from Singapore to Dubai. Even the personal tablet that each seat has is significantly dated and the screens on these are also a lot smaller. I ended up rewatching a few Harry Potter movies on my flight home since I have actually had a pretty good time in the Universal Studios back in Orlando and wanted to relive some of those moments on the flight (also because I could not remember half the characters that showed up during the rides). The flight departed on time at approximately 9:15PM local time and shortly after takeoff, the cabin crew made their way around to take drink as well as dinner orders. Since I have actually had plenty of sleep on the previous flight (unintentional! ), I was wide awake and therefore decided to have a meal instead just for this review (the photos turned out terrible due to the mood lighting and also because the entire cabin was mostly dark since at least half the passengers chose sleep over gluttony). I asked for a glass of Champagne and they also gave me a small dish of warm assorted nuts to go along with it. The Champagne served on this flight was from Moet & Chandon and before you cringe, the Grand Vintage 2009 is actually quite drinkable. In fact, I dare say that it is the only one that I actually can stomach from Moet & Chandon. Dinner service started quite quickly as I believe the cabin crew wanted to get it out of the way so the passengers can quickly go to bed and not deal with jet-lag the next day like I did. For my appetiser, I selected the Smoked Salmon which was served with green gazpacho. Alongside the appetiser was a barley, vegetable and mozzarella salad which was quite tasty but I did not feel like having yet another salad after spending two weeks in the United States. Since I was not particularly hungry, I opted for the Grilled King Prawns as my main course - there were also the option of the Coconut Braised Beef Short Ribs as well as the Chicken with Moroccan Spices. The prawns were delicious and they were served on an egg fried rice with Chinese mustard and orange sauce (?!) on the side. For dessert, I went for the Passionfruit Tart which was simple but tasty - it was also served with red-currants on the side. I tried to go to sleep after dinner but I guess having a fully belly and plenty of sleep before this does not help me drift off to bed easily. As you can see in the photo above, the seat controls are fairly simplistic on this flight - you can opt for the angled-flat bed, the cradle position of the default position that is required for takeoff and landing. I personally can't sleep when there is someone sitting next to me (stranger or otherwise) so I gave up trying after a short while. While I was moving about in my seat, I accidentally pushed on the buttons of the IFE Controller on the side a number of times. I have accidentally called for a cabin crew, paused my show and also fast-forwarded it a number of times just because I leaned my elbow and body towards to right. Not a big issue since I did not experience this on any other Emirates flights but it was slightly annoying since I had to make a constant effort not to do it. 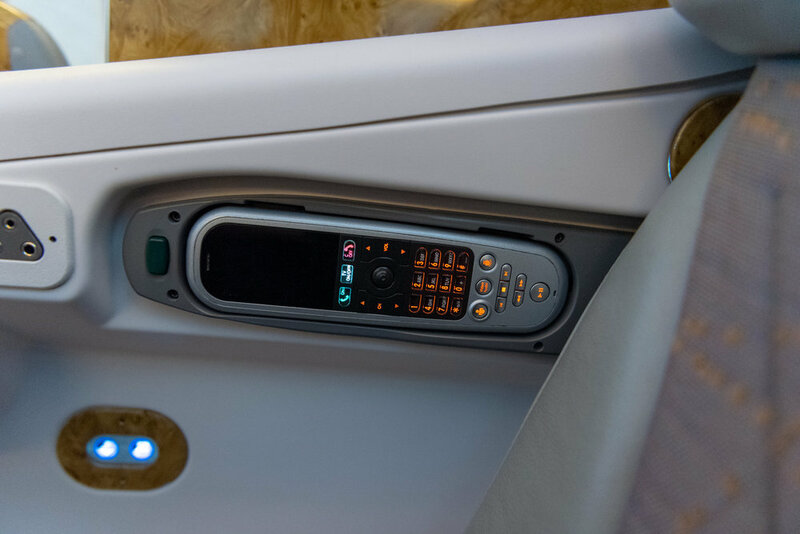 Thankfully the cabin lights started to come on after a couple of hours as continental breakfast was served - if you are planning on sleeping on this flight, I would suggest that you skip this meal service since it is rather forgettable. If you are going to pick food over sleep, it needs to be more compelling. Since I was awake throughout the whole flight, I was amongst the first to be served. 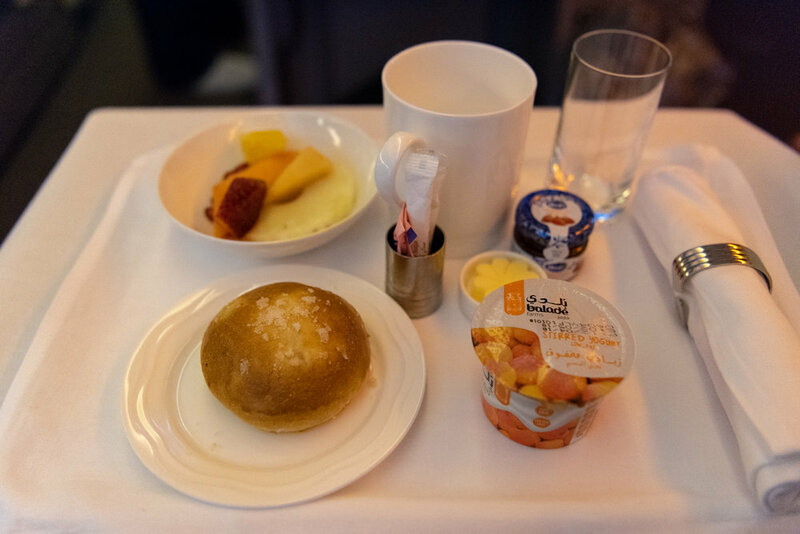 Continental breakfast on Emirates consisted of a warm bread, some sliced fruits, a yoghurt as well as some brewed coffee (I really just wanted coffee). Flying on Business Class with Emirates has made me missed my espressos on Singapore Airlines. Don't get me wrong though - Emirates does serve espresso coffee in Business Class but it just doesn't feel right to order it because it seems to break their flow of service. On Singapore Airlines however, I felt like I would not be inconveniencing the cabin crew as much (perhaps because they are friendlier?). 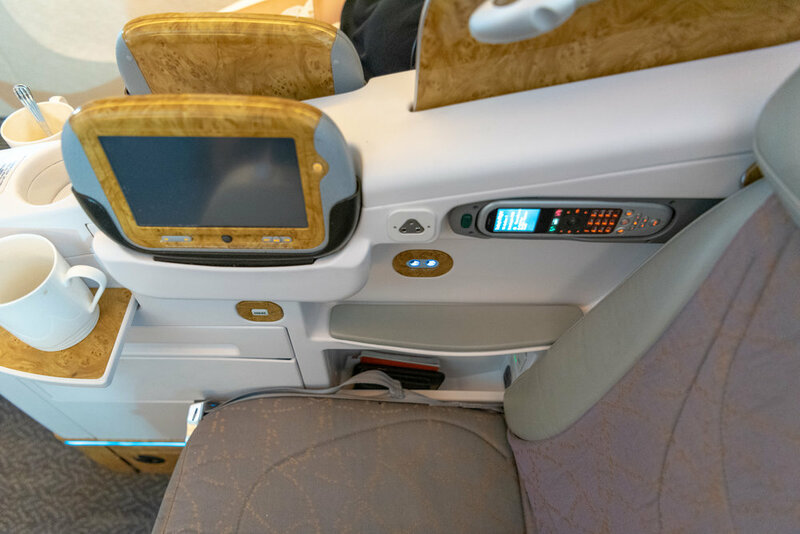 I like the Business Class product on Emirates' A380-800 planes a lot but the ones on 777-300ER, not so much. I would probably try to avoid flying on the 777-300ER product on red-eye flights as much as possible (unless it is significantly cheaper) but a day-flight should be alright.